Discussion in 'Lakers Discussion' started by bfc1125roy, Nov 7, 2018. Let's look at a team that loves to play small ball -- Houston -- as they are coached by D'Antoni, one of the modern pioneers of this idea. In last year's playoffs they went up against Utah, who boasted the DPOY big man in Gobert. Normally, this would have spelled a death sentence for Houston in the same manner we have struggled, but we can learn from how they dealt with the mismatch and used it to their advantage. Notice below how Capela sprints hard after the missed shot, forcing Gobert to switch onto Tucker. Now I understand Capela isn't your prototypical "small ball" center, but the idea is the same. The Lakers play at such a high pace that if our small ball 5 ran harder in transition, we could create a mismatch easily. This is where we give up a lot of rebounds. Let's look at the same series as before. Houston's defensive communication is a lot better, and by game 3, they know to switch everything. This means that it takes away the easy options out of the PnR for Utah, but gives Gobert the ability to clean up on the offensive glass. Watch how Ariza switches but boxes out HARD. Although the shot is off, this would have prevented Gobert from following up. Ingram could easily be doing the same thing. Combine this with getting out quickly on the break and forcing mismatches on the other end like I described earlier, and you have a very deadly gameplan. 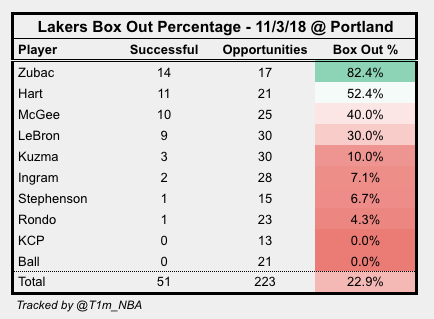 Just to give you an idea of how we are doing on our box out numbers... this is from our game versus Portland the other day. Clearly a lot of room for improvement, in something so fundamental. The easiest way to take out a big man with a small ball lineup on offense is to involve him in weakside action. This takes the big man out of the paint and gives you a clear lane to attack with a quicker lineup. Especially if you have a small ball 5 who can shoot the 3 (Kuzma, LeBron), the big on defense has to honor that threat. It's easy to exploit this if you have lots of players who can attack the rim and make plays - which we do (LeBron, Rondo, Ball, Stephenson, Ingram, etc). Look at this example from the Boston-Philadelphia playoff series. This is an extremely basic version of what I am talking about. This isn't even happening on the weakside, but notice how Horford sends Baynes to the corner to pull Embiid out of the paint. Tatum then executes perfect weakside motion and slips the screen to get an open layup at the rim with nobody there to stop him. Roster wise, we are equipped to do everything I have described. Even with Chandler, we do not have to give up on small ball just yet. Rather, we just need to be smarter about how we execute based on the advantages we have - in transition, defense, and offense - and gameplan appropriately around them. The Showtime Mamba, Lakeshow85, sirronstuff and 10 others like this. Really enjoyed your post. Lots of great ideas. However, we need a coach who can implement these ideas, and Luke hasn’t shown the ability to run an intricate, high powered offence or defence yet. Nice post . I'd like reading ( maybe it was already written) an article on Lakers skills development coach(es) and what the players are working on on a regular basis . The lack of fundamentals ( box out , proper screens settings) from our young players tell me this "department" is doing a poor job . As for the small ball lineup , the Zo/Hart/BI/Kuz/Bron one has only spent 8 minutes for a 23.8 net rating , it's time to see more of it . Lakeshow85, bfc1125roy and Cookie like this. As odd as this may sound, this primary intention post was not meant to be a dig on the coaching staff. Rather after the Chandler signing I started thinking, how did teams that relied heavily on small ball exploit larger front courts? Some of the best teams (Boston, Golden State, Houston) all rely on small ball lineups in important playoff situations. Obviously being able to shoot the 3 well (which is where we struggle) is a big component, but there are other important aspects as well that we could be capitalizing on. That you for this post. It's easy to understand and the examples are good and fun to watch. The question is this: why aren't we doing more of this? My quick thoughts: 1. Effort 2. Rebounding and 3. Defense in no particular order. Lakeshow85, sirronstuff, JohnnyComeLately2k6 and 3 others like this. interesting. i'd like to see some comps for box out percentage--what's league average? i imagine it varies by position. what constitutes an opportunity? my sense has been that boxing out is a lost art and could solve a lot of problems for some bad teams (and us), so i'm curious about the manner in which this is tracked and how we stack up. Lakeshow85, sirronstuff, abeer3 and 2 others like this. 1. Transition - This would probably be our only major advantage. We are one of the fastest teams in the league in pace and we move the ball really well, IF we are able to secure the rebound and get defensive stops, and don't turn the ball over. 2. Defense - I don't mind the switching, however, we really don't have a defensive leader or ace on the court at the moment and lack communication severely. Hart seems to be emerging as that player, Ball plays really great defense, and Bron is one of the best help defenders. The main problems stems simply from the pick and roll, where the switch takes place. Two things I've noticed other team do against us and what we aren't doing is hedging the ball handler and denying the entry pass as well as not rotating correctly over to the next player. Additionally, our small ball 5 NEEDS to be a player that has to be able to box out and rebound as you've alluded to, and focus specifically on that so that when we get stops, we don't give up second chance points and we put our team in a position to get out in transition, our strength. Right now, I don't see one player at the 1-4 that can provide us that, hence why we're better off with McGee and now Chandler holding down the 5. 3. Half Court Offense - The issue with our small ball half court offense is that we lack the outside shooting to really keep defenses honest. Kuz, Lebron, Lonzo, and Hart all can shoot, but they aren't that knockdown shooter that defenses have to respect. So what we've seen is defenses just collapse on us and allow us to take low percentage shots. As much as we try to move the ball and use off ball movement, it only works sometimes. So even with players who can penetrate and attack, we can't get the proper spacing without shooting and defenses packing it in. Funny enough, this team would actually do REALLY well with the Triangle Offense if Lebron was in the post, and if Lebron was a little more proficient in the post. His passing is already there, his vision is elite. He's so strong, he could really bully ball a lot of players down low to draw double teams, then use his vision to find open players using cuts and moving into open space that the triangle does. I asked myself the same question. There's no one answer. But things like sprinting back in transition to create mismatches, and boxing out, are all effort related. Whether it's the players being lazy or the coaching staff not emphasizing this enough, I don't know. Lakeshow85, abeer3, karacha and 1 other person like this. If only our coach knew the triangle offense, right? Lakeshow85, JohnnyComeLately2k6, abeer3 and 2 others like this. Absolutely. But this team should be more than capable of doing what the Rockets are doing, right? Lakeshow85, abeer3 and bfc1125roy like this. Communication is important on defense, but so is a consistent strategy. If the players are told to switch everything (which, when playing small ball, I think they should) then they don't have to make these decisions on the fly, reducing the margin of error. This makes it easier to also stick to your man closely and box out better. If Ariza can consistently box out Gobert, then LeBron, Ingram, and others can handle most of the centers we come across. Chandler helps, of course, but we should also be playing to our strengths with our length and quickness. Kuzma and LeBron, among others, are enough of a threat from 3 that if they just went to the corner it automatically forces the other teams center out of the paint. If he rotates over, that's an open shot, and we have the passers on this team to find that every time. We can complicate it by having the small ball 5 move around on the weakside to distract the other team's center more, opening up the lane for easy opportunities. I agree that shooting needs to improve, but we can still take advantage of situations like this. I think so. Nothing I posted was mindblowing, but just a case of playing to your strengths. We have the talent on this team right now to do everything I said. I'd love to see us double down on some of these principles to attack other teams. I saw flashes of it in our win against Denver, but there is a lot of opportunity we can take advantage of. See, the difference with Ariza and like Lebron and Ingram is mentality. Ariza is a player dedicated to defense and is willing to box out, where Lebron and Ingram aren't, despite both being immensely more talented offensively. Like I said, we don't have a player that dedicated to defense with exception to Hart, but Hart is too small, despite his effort and strength at his size. Even Javale relies on his athleticism for rebounds, rather than actively box out. Hence the reason why a Draymond Green or Ariza can work in those small ball lineups. I think the most effective way to take advantage of a big with small ball half court offense is to put him on ball. Use a screen to switch him onto the ball handler and force him out of the paint. This is where I've noticed our biggest impact when we isolate the big on the perimeter, taking them out of their comfort zone, and opening up the paint. Then when we attack them off the dribble, we need off ball movement to get into open space when the help comes. Or as Lonzo did against Jokic in the game against the Nuggets, fake the drive into the step back jumper. Jokic didn't have a chance. Nice, written post with some great insight. Lakeshow85, Cookie and bfc1125roy like this. I heard NBA writer Dan Woike on this podcast about the with lineups differences with Kuzma/LeBron & like who they should targets shooter wise.. kinda would work small ball wise. To corroborate bfc's stance on securing defensive rebounds, Synergy actually tracks box outs this year and we're 2nd to last. Last year we were ranked 13th in defense and securing those boards (being 2nd best in defensive boards per) certainly attributing to that. (Un)Surprisingly this year, the Bucks lead the league in dboards. It's almost like someone is actively boxing out so that Giannis can get all the glory of bringing down video game type rebounding numbers....now who could that be? (One of the most curious free agent decisions this last summer cause it seemed like dude wanted to stay). Some of y'all are s***ting on Kuz's rebounding numbers this year, but he and McGee are the only ones actively boxing out so that BronZoDo can leak out and start the break (which we lead the league in). Also McGee leads the league in block shots, so if he's going to contest, how can he also get back and boxout to secure the rebound? More of our guys (particularly BI and Hart) need to box the f*** out so that BronZoDo can gobble up those boards and push.